One person had to be cut free after a two-vehicle crash in Sheffield Park this morning (January 11). 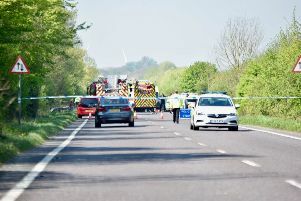 East Sussex Fire and Rescue Service were sent to the scene, on the A275, at around 11:35am. Two crews from Uckfield and Lewes were sent and used hydraulic cutting equipment to free one person from the wreckage. The injured person was left in the care of air ambulance crews and was transported to hospital. Firefighters left the scene at around 12:30pm.